Call it the PC-ification of the fireplace. 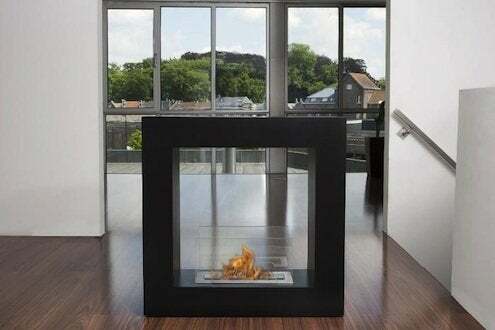 A company called Bio-Blaze is selling a line of portable, vent-free fireplaces that you can roll into a room or out onto a patio, hang on a wall, or use as a centerpiece. Many designs are available; all are based on a simple concept: the burning of corn-based ethanol. Because it’s ethanol being burned, these units give off small, cheery, golden flames, but there’s no smoke, soot, or smell. 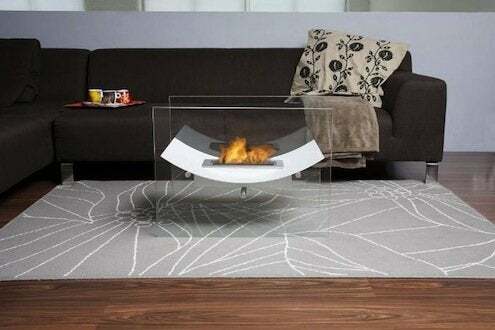 And because the burners are small, Bio-Blaze fireplaces give off little heat. Just as PCs took the power of computing away from immobile mainframe computers and put it in your home, Bio-Blaze has taken the magic of fire out of the wall and put it wherever you are sitting. This is one of those decor innovations that, while not in any way necessary for ordinary life, is utterly aspirational. The only practical use for, say, the Qube model (pictured above) would be ambient lighting during a power failure. The company has come up with a staggering number of variations on the theme of mobile fire. The Qube is nice as an ironic commentary on how content we are staring at black-framed electronic boxes; models like the Veniz are sculptural-looking and almost poetic. While these fireplaces won’t choke you out with their exhaust, they are burning oxygen along with the ethanol, which means there must be enough fresh air in the room or you will suffer an awful headache, or worse. The flames are real, so you don’t want to put a unit near curtains, your oil paint set, or the crochet throw. And it may be a good idea to put the unit away before your next costume party or Henry VIII could end up with burns of the third degree. For more info, visit Bio-Blaze.